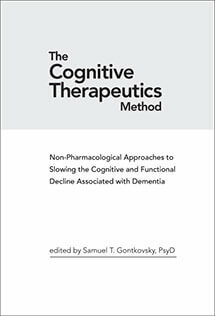 Cognitive Therapeutics Method™ is the seventh book in our senior wellness series and focuses on the Cognitive Therapeutics Method™. Dementia has been called the most significant global health challenge of the 21st century. Thus, it is increasingly necessary for scholars and professionals across disciplines who work with older adults to have a thorough understanding of dementia and the types of interventions most effective in addressing associated cognitive and functional decline. A comprehensive and well-researched volume that builds upon the burgeoning interest in the role of neuroplasticity in non-pharmacological interventions for dementia, The Cognitive Therapeutics Method™ is a necessary addition to the library of every scholar, clinician, researcher, and geriatric care professional with an interest in dementia care. Providing a balanced and in-depth analysis of the literature and exploring the evidence around myriad modalities of non-pharmacological interventions targeting problematic behaviors, mood issues, overall functioning, quality of life, and cognitive functioning deficits, the well-edited volume is an important and timely work. Dr. Samuel T. Gontkovsky is the Executive Director of Research and Development at Home Care Assistance and has led the development of the Cognitive Therapeutics Method, an in-home cognitive activities program. He brings more than 15 years of professional experience in clinical practice, research and teaching, and was head of the Department of Psychology and the Pain Management Program at the Nebraska Medical Center before joining Home Care Assistance. Dr. Gontkovsky has published more than 75 professional articles, books, book chapters and book reviews and has given more than 125 presentations at local, national and international conferences. He serves as a reviewer for numerous journals and professional organizations in the area of psychology, neuro-psychology, medicine, health and rehabilitation.